Posted on 28 June 2018. On arrival into the Novotel St Kilda the team were soon on the move again heading to Fitzroy Street to share an Italian meal together prior to running along St Kilda Beach early the next morning. It was great to share more of this journey to compare notes with much of the time on the run solo after running with Glen in Perth. After taking some time out to rest up we were soon back into it again although on leaving the hotel this time around it was clearly the coldest morning of the week to date with the chilly morning piercing through multiple layers, beanie and gloves. 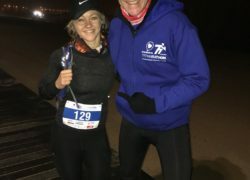 It was a real highlight to meet up with Michelle Steenhuis after originally meeting in the Sahara Desert to share the Marathon des Sables earlier this year. Michelle a very talented personal trainer, cross fit athlete, runner and anything that she sets her mind to had made the early morning drive from Ballarat to join me on the start line with plans to set out to run the Half Marathon super fast. There was a very good turn out of state runners with a few familiar faces in Melbourne to share the freezing cold and overcast conditions on St Kilda Beach which while not the ideal weather to help with the recovery would be simply a matter of doing my best to endure and get the job done once again. 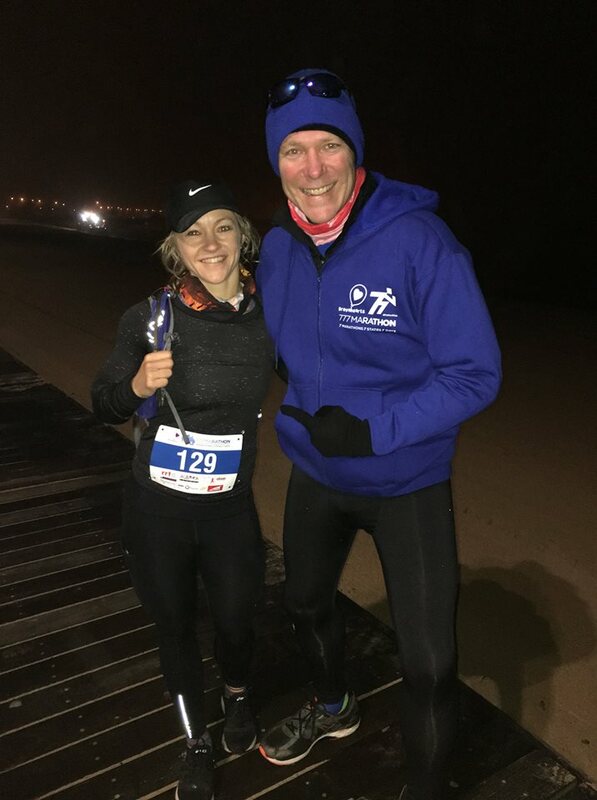 The highlight of the day was to find Michelle around half way into the race all rugged up after finishing the Half Marathon taking time out to share some of the journey with me on the run to catch up which was sincerely appreciated in such cold conditions. I was super impressed to find the Melbourne Bike Share program resembling the Citi Bike set up in New York City Center while on the run in St Kilda and thought that perhaps the Sydney City Council and NSW Government may soon borrow some of this intelligence to help clean up the random bike share mess across Sydney. This was a very challenging day in dealing with the freezing cold conditions, advanced flu symptoms and exhausted legs and it was so nice to finally get across the line in 6:03:07 with little time to find a hot shower and take in some cold pizza leftovers before returning to the airport to make our way to Hobart to continue the adventures.